What has prompted Pyongyang to make this unprecedented acknowledgment? North Korea’s Foreign Minister Ri Su-yong made the somewhat surprising statement on September 27 at the UN General Assembly meeting that his country was willing to work on human rights with the UN and other international organizations, although he still chastised the U.S. for politicizing the issue. While Pyongyang has still not directly addressed the UN’s February commission that asserted there was extensive evidence of crimes against humanity in North Korea, it is showing further signs of cooperation this week, albeit still of a more symbolic than practical nature. Before discussing North Korea’s seemingly breakthrough acknowledgement of its “reform through labor” camps, an idea of the overall scale of the North’s political prison camp system is instructive. 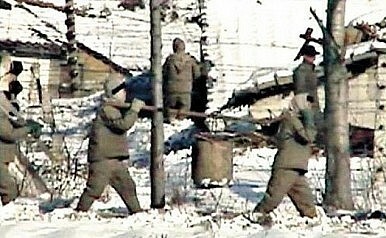 On Wednesday, a South Korean representative estimated that “based on material from research institutes at home and abroad and the analysis of satellite imagery, the total area of North Korea’s five prison camps was found to be 1,247.9 square kilometers… or twice the area of Seoul, which is 605.2 square kilometers.” According to a June report from the Korea Institute for National Unification, the North’s five main “concentration camps” hold between 80,000 and 120,000 prisoners. The two officials echoed Ri’s earlier statements, that Pyongyang doesn’t oppose dialogue on human rights so long as it isn’t a “tool of interference.” Greg Scarlatoiu, executive director for the Committee for Human Rights in North Korea based in Washington D.C., says that the acknowledgement is what is important, as Pyongyang’s usual approach was to ignore reports like the UN’s, while overshadowing them with “nukes, missiles and military provocations.” He said the North is now on the defensive because the February report has created a discussion that has not gone away. While North Korea’s leadership may in the past felt that its human rights issues were not something it needed to respond to, it issued its own report in September to rebut the UN’s assertions. Pyongyang could be attempting to get out in front of the next UN resolution, which is likely to again be submitted by Japan and the EU. However, this unprecedented admission could also be linked to its overall attempt to improve its international ties and isolation recently.